Last September, a day before the opening of the exhibition connected with our anthology "Making Room: Cultural Production in Occupied Spaces," a group of activists gathered at the MoRUS museum on New York's Lower East Side for a talk about squatted social centers. Some of the activists were traveling with Crimethinc's "Change Everything" tour. Brian of Crimethinc, he of the long dreads who debated Chris Hedges a few years ago on the question of the black bloc in the Occupy movement, is wandering around the edges of the crowd. It's small. 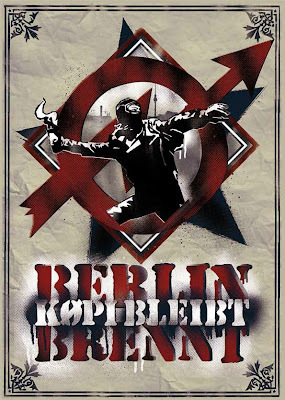 The tour, we are told, is part of a global dialogue between anarchists all over the world. The pamphlet text has been translated into many languages. The speakers this night were from the squatting movement in different contexts -- Slovenia, Sweden, Argentina, and Scandinavia. Bim of Stockholm speaks first. There is not much of a squatting culture in Scandinavia. Tenants' rights there are stronger than in most countries. In early summer Bim was part of a squat in a southern suburb of Stockholm. The suburb had been built around a metro station there. 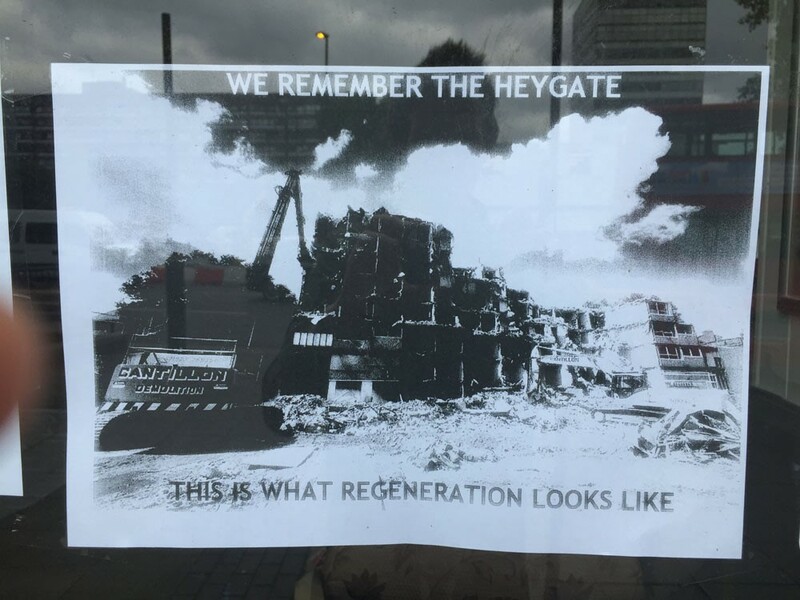 The building they squatted had been sold to a private company pushing gentrification. They planned new construction advertised to higher income people as "15 minutes from the city." Demonstrations and organizing was done against this. This included concerts, free shops, and other events. Finally they took over the building to show that it could be renovated. They expected to be evicted quickly, but they weren't. "So we were surprised to have a building." We had to figure out what to do with it. People came quickly. "They didn't plan to make a social center. It just happened." This showed the need for such a place. The free shop was full of stuff within hours. "Everything sort of happened by itself." This was surprising since Sweden has no history of doing occupations. The assemblies were long meetings which were exhausting. People were "differently educated," so we began to break out meetings by topic. For us, without the experience of Occupy, this was something new. We didn't promote rules because we wanted to be inclusive. In [Hed-dollen, the town of the squat] there is also a skate park and Cyclopen [another squatting project]. But you can never have too many spaces. The legal spaces would not be in conflict with what was happening in the area. [Stockholm also has a network of suburban art centers, some of which I visited during the Creative Time Summit there in 2014.] We were not just a group of punks. Even for people who were not radical, "we experienced that we could do something." Still, after a month of work, the initial group was burned out. I was involved in two projects in Rosario and in Buenos Aires. One had a number of provisions. The other, in Buenos Aires, was a really big old pizza place taken over by neighbors when it was shut down in 2001. Since then there has been increasing repression and evictions of important spaces. Spaces opened up for a year or more, opening up possibilities, and then closed down again. Ileana was also involved in a squatted house, "living politically together." People there were engaging their "micro-political relations and their decision-making." It was really exhausting. Assemblies in the social center are "a coming together of different bodies." In the house, as versus the social center, that process was very different. We talked about our emotional relationships. We assume that horizontal spaces are going to be horizontal, but they aren't. Shifting affinities are something to be aware of when talking about horizontality. This goes to the question, What is collectivity? I gave up a lot to live in that house in Buenos Aires. But my whole self does not need to be decided upon by an assembly. This is a subtle thing. There is tension in our relation to the collectivity. Finally, it's a question of how we care for one another. Ramona from Slovenia spoke next. In that country, she said, the squatting culture emerged in the early 1990s. 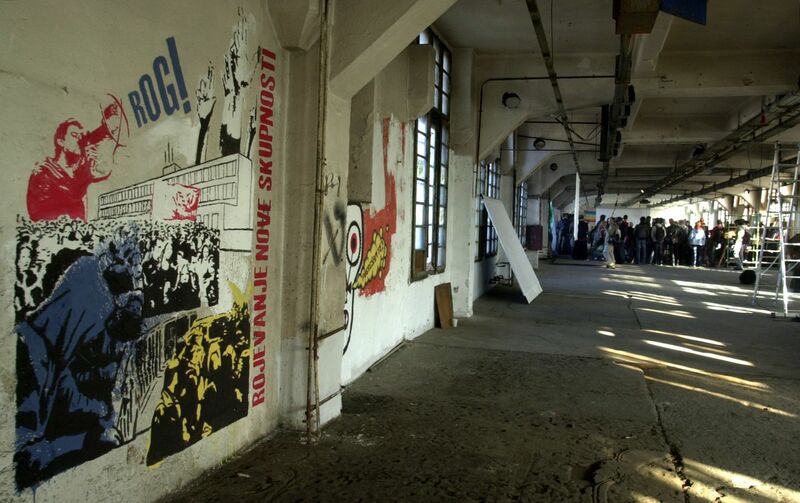 The Metelkova military base in Llubjana was squatted in 1993. The Rog bicycle factory is another. Ramona comes from the anarchist infoshop in Metelkova. The late 1990s saw a wave of residential squatting. We were allowed to have our infoshop in Metelkova, but we also lived there. Every kind of project is there. [She names them.] The 22nd anniversary was just last week. Gentrification has intensified in the last five to 10 years, and we are now into the third generation of squatters. We ask what role or function we play in this process? Metelkova looks very open and friendly. For young people it is one of the last places in the city they can hang out without consuming. 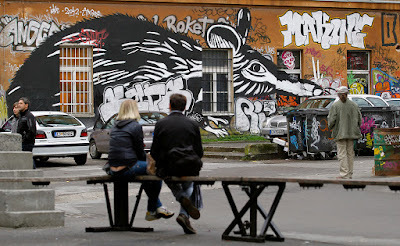 Tour guides promote Metelkova. "We see 10 or 20 cameras every day trying to take a picture of the natives." The city mayor complements Metelkova as a zone of critical thought -- the "ghettoization of critical thought" is imposed upon us. 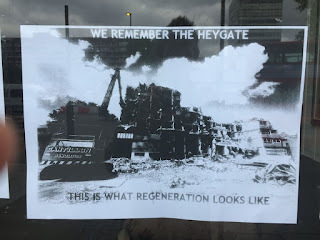 We ask, what is the role of a radical community which is a part of this squat in the face of gentrification? When creating these spaces we want them to last. But institutionalization makes them more open to cooptation. The state deals with the emergence of resistance in terms of repression. The other way is sending inspectors, and of course we fail all those tests. It's a way to pressure us to legalize. The squat produced cultural value which is capitalized by the state through tourism. While it might be tempting to legalize, why do we fight for autonomy? Metelkova was an expression of deep disagreement with the way the city was developing under capitalism. It is easy to forget this conflict orientation as the space closes and becomes self-sufficient. It is "a tiny island of resistance.... If it doesn't go into conflict with everything else around it, it has no meaning." Sara from Ljubljana then spoke. There are a quarter million people in the city. Both squats -- [Metelkova and Rog] -- are in the center of the city and they are huge. The origin of Rog is connected with the story of transition from Communist rule. This was more gradual in Slovenia than in other Eastern Bloc countries. But we have been facing increasing precarity and austerity. Rog was a very successful bicycle factory, but it shut down in the 1990s. Different speculations were made on the building. 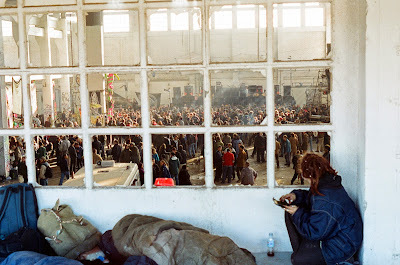 In 2006 it was occupied as a production space by collectives which had prepared the occupation. 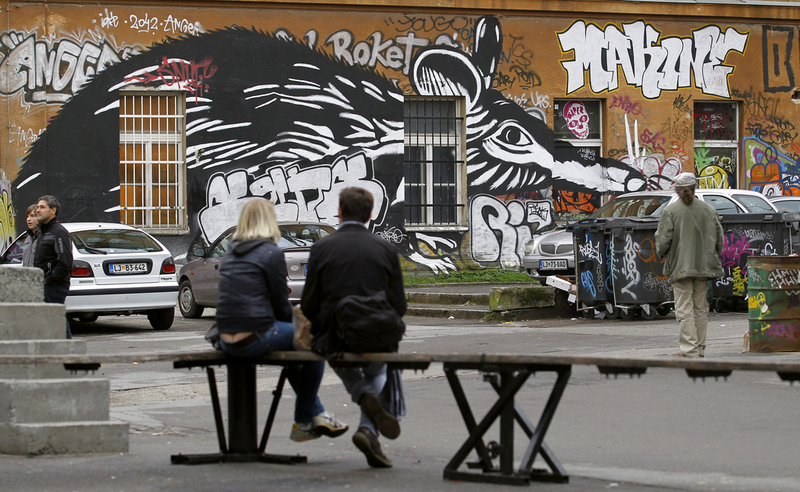 Metelkova emphasizes alternative culture. Rog emphasizes social production, not only cultural production. Temporary usage was a leading concept. We will leave when the city decides what to do with it, but in the meantime it needs to be used. 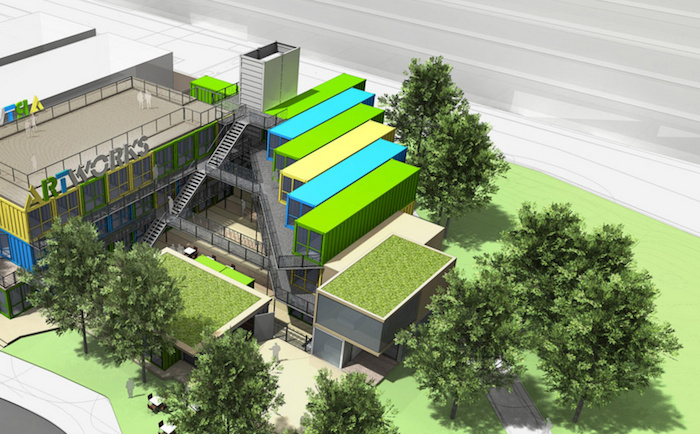 In a couple of years we realized we were collaborating with gentrification, so we began to think how to develop. We turned into a center of cultural production. With the Europe-wide economic crisis, the city could not find an investor to develop the space, so we are there 10 years now. In the beginning, it was very nice, with solidarity and so on. Then with the first winter, a huge factory with broken windows and no electricity, it was hard. Many people left. 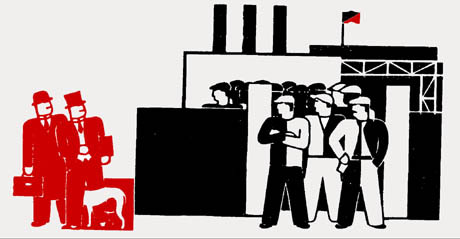 Many collectives began to build their own spaces within the factory. [She names various uses.] After two years the assembly became very hard, then it stopped, and restarted on a new basis. We believe in "non-perfectibility." We are "inclusive, non-hierarchical and non-institutional." David of Rog: The "social center" within Rog has seen itself as political from the beginning. There have been two broad phases. 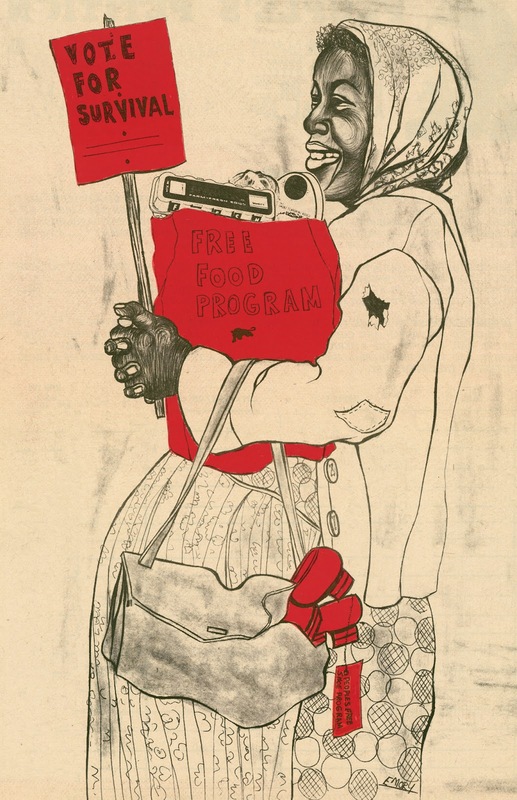 The first was a campaign-driven collective with clear politics around the "struggle of the erased." This concerns the 25,000 people who lost citizenship during the transition. It's a complex story, but this campaign started in the early '00s and continues. Another campaign concerns the rights of migrant workers. They lost rights with the crisis and were never paid. People were in the social center because of these campaigns. It was also always open to community initiatives. The second phase came with Occupy Slovenia, a five-to-six-month occupation during which many activists became engaged in the Occupy struggle, and went away from the campaigns. The space became more about being collectively organized. A new formation is the Precarious Wasps' Nest of Workers meeting, also the Insurgent Women Social Workers which started in 2013 with a radical approach to social work. The media collective asks what does our space mean for us, and what is its function in the wider society? Metelkova is an autonomous social centre in the centre of Ljubljana, Slovenia. During my recent book tour for “Occupation Culture,” everyone wanted to talk about gentrification. While it is certainly involved, squatting really isn't about that... At the “Making Room” show at ABC No Rio this past September, however, we hosted a talk by Erick Lyle, whose new book “Streetopia” documents and reflects on an artists' project that got right to the point in San Francisco. My notes are below. That city is changing fast, under the pressure of a massive wave of super well-paid tech workers. Everyone there, if they are not counting their money, is worried. 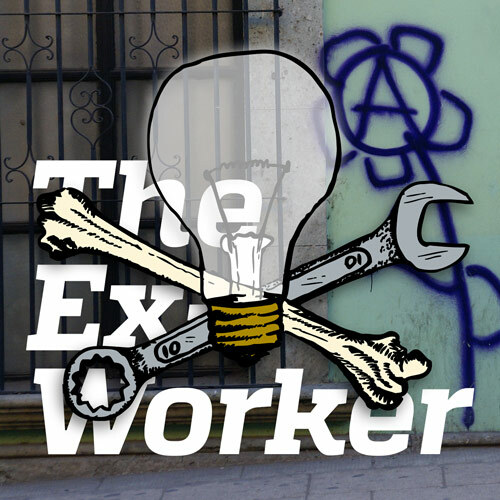 Chris Carlsson, the great San Francisco historian talks about that; and the anarchist writer Cindy Milstein has been reporting the many struggles which have broken out in the street, where increasing numbers of San Franciscans are finding themselves. The project took place in the Tenderloin district of San Fancisco. Erick explained that the mayor intends this part of the city "to be a dot com corridor" of tech businesses. The second dot com boom is underway now in SF, "Tech 2.0." The first dot com boom in San Francisco saw a united organizing response which resulted in key legislation. This solidarity has dissipated. “Streetopia” was an opening cry from the artists' community. Erick has written about this great adventure, a covert occupation and development of an abandoned movie theater, in his book On the Lower Frequencies That book is “a manual, a memoir and a history of creative resistance and fun in a world run rotten with poverty and war.” While Lyle's best known zine venture is called Scam, his book tells of a less well-known photocopied project, The Turd-Filled Donut, which largely concerned the SFPD which was beating down hard on him and his punk pals back in the day. The Luggage Store Gallery, a 35-year-old project which owns their building, was the partner for the “Streetopia” project. “We were making art projects for the people living there, he said. The artists built a simple structure which combined a bleacher-type seating with a stage. They "funkified" the gallery space. The architect was inspired by the St. Louis city museum, an "unsafe structure" with labyrinths. Although maligned, the Tenderloin district has strong community organizations. The idea of the show was to amplify those. For example, "What if the space of Occupy was normalized and made constant?" For the five week run of the show, there was a free cafe -- inspired by the Diggers; a "healing arts studio," where they practiced tincture making, and led ex-urban herb walks. The idea was to heal the city trauma due to displacement. 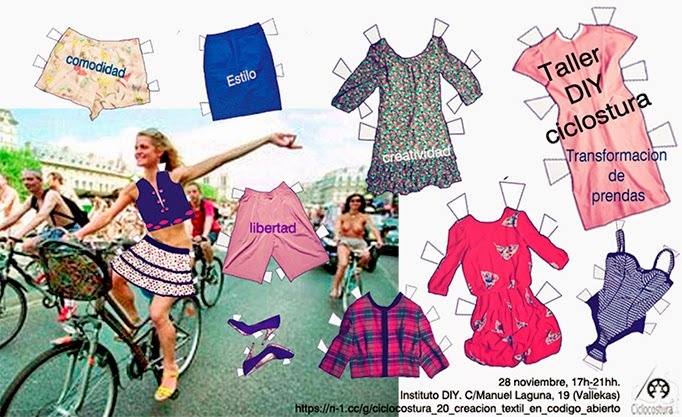 Julian Dash did a Holy Stitch project as an afterschool with kids, remaking and selling clothes. There was a stand selling coffee and trees, nurselings in planters. 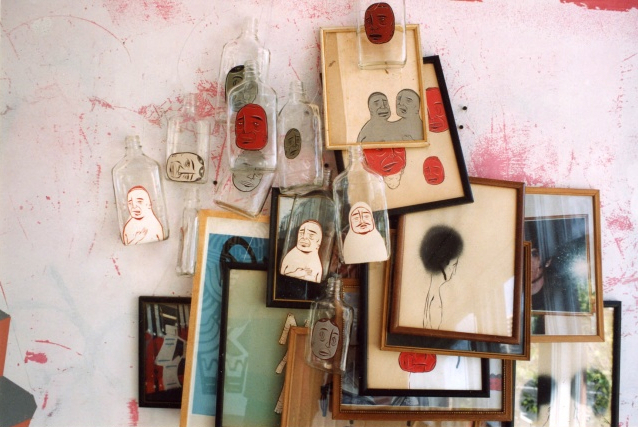 The Drug Users Union which seeks to set up safe injection sites, as exist in the European Union, collaborated with Barry McGee. They mocked up a design for a safe injection booth. Out of this came another group, the Urban Survivors Network. Sarah Lewison's project was to reactivate a communal news network. The Kaliflower commune network of newsletters claimed to circulate to 300 communes in the Bay Area during the 1970s. All of this was non-monetary. It was not the "sharing economy", but real sharing – "a lost world." Silicon Valley and the gentrifiers have stolen that language from us. For the “Streetopia” artists, real time was important, so they did not photograph everything. Even so, underground hobo celeb Bill Daniel was artist in residence, making photographs. Bill made the film classic “Who Is Bozo Texino?”. As it happened, he also showed up at ABC No Rio in September as well, touring his vintage photos of punk shows in Texas. The artists of “Streetopia” did skill shares, for example how to find information about the city's hidden forces. Sarah Schulman came and talked about ACT-UP. A new group is using ACT-UP tactics to shut down banks. Caroline Dins made a project about James Baldwin. He did a PBS documentary, "If I Had a Hammer". Fifty years later, Caroline found the kids from that film, and talked to them about the legacy of neglect of the neighborhood. In the discussion after Erick's talk, people noted that there has been some community land trust action in SF to preserve art spaces and housing. Sarah Lewison called this settling of younger people "a resuscitation act." With this tech stuff, "it's like the coming of the railroads," a reorganization of urban space on that scale. Today we have "a dialogue of powerlessness," complaining about stuff like gentrification. The tactics used by power to change and degrade communities are not clear. It is like the AIDS crisis, when people were dying and nobody in power was talking about it. In the Lower East Side, said Fly Orr, we witness the takeover of the community by high level transients -- students and workers who don't plan to be here for very long. She works at the Lower East Side Girls Club where many people come to meet and organize. “Streetopia” – Order the book from the artists' collaborative JustSeeds for just $20. This post will be the most complete listing of events around the "Making Room" exhibition at ABC No Rio this fall. It will be continually updated. There are other spots where events are more fully described, which are mostly all hyperlinked here. We are all very excited about this event series, and look forward to an exciting and productive month in the Big Apple. FIRST UPDATE: Seminar of Wednesday, 9/23 is cancelled. 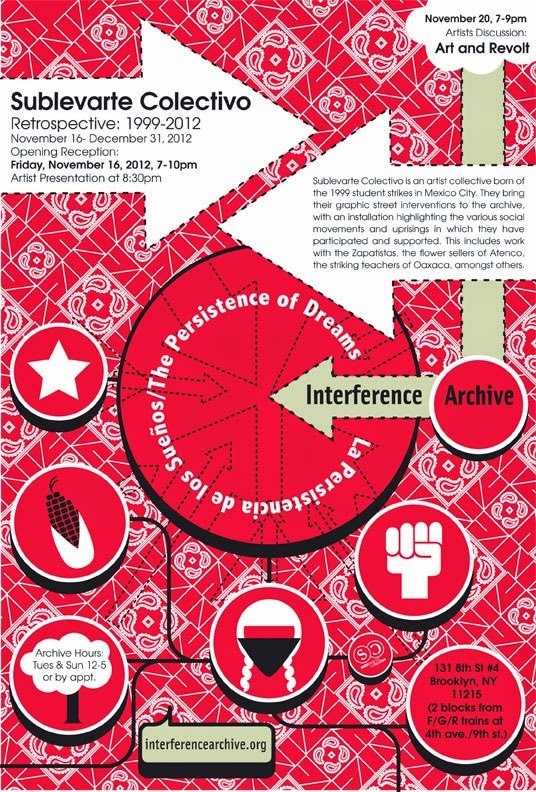 The principal session is Sunday, 2-5pm at Interference Archive. Registration recommended to awm13579 [at] gmail.com. Interference website re. the seminar is here (with right now the wrong time for 7/22). "Last Squat City: A Fly’s Personal Archive"
Photo above: Tovarna Rog center in Ljubljana, Slovenia. Photo by BoBo. The upcoming exhibition at ABC No Rio arranged in conjunction with the release of the "Making Room" anthology (and lurking in the background, this blogger's own coincidental publication of "Occupation Culture") is opening September 16th. An extensive series of events is planned. Details are posted below, with hyperlinks to more information. The show closes October 15. The gallery is listed as open for viewing hours: Sundays 2:00 — 5:00pm Tues, Wed, Thurs 4:00 —7:00pm. It will also be open during the hours of special events. It will be open at other times, when me and others are there, and during the as-yet-unscheduled Christiania conference reports, but you should call first to be sure. (Christiania reports will happen between 9/24-26.) Spontaneous or appointed open-door times will always be after the noon hour. "Making Room: Cultural Production in Occupied Space"
Alan Smart and Jack Henrie Fisher of Other Forms are designing this exhibition at ABC No Rio based on the anthology book “Making Room: Cultural Production in Occupied Spaces”. Both "Making Room" and "Occupation Culture" are available online as free PDFs. 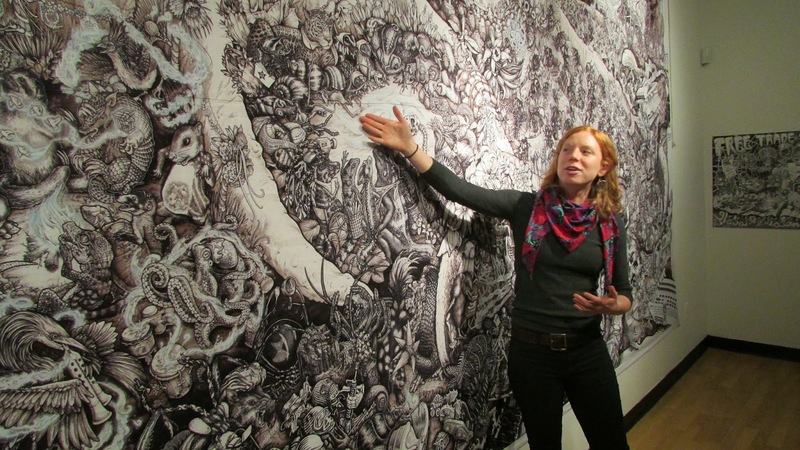 Storytelling and discussion with squatters, artists and researchers, moderated by anthropologist and oral historian Amy Starecheski, author of the forthcoming "Ours to Lose: When Squatters Became Homeowners in New York City" and squatter archivist and artist Fly. A conversation with the renowned artist and cultural critic Martha Rosler. The discussion will be keyed to her book Culture Class, and turn on relationships between her artistic practice and urban politics. Pockets of the underground continue to exist and re-form themselves amidst the city's current hyper gentrification. New generations flock to New York in order to “make it” their own and compete in the arena of history makers. For one weekend only, Booklyn presents a prominent culture war of squatters, itinerants, anarcho-punks, community gardeners, and artists who banded in different capacities to call of one of the most expensive American cities home. Last Squat City: A Fly’s Personal Archive is culled from the extensive archive of artist, activist, squatter, and Lower East Side icon, Fly, whose zines and comix (including PEOPs, Dog Dayz and Zero Content), and illustrations (MAXIMUM ROCKNROLL, Slug & Lettuce, World War 3 Illustrated, NY Press, etc) documented the squatters' movement resisting real estate developers, avoiding police batons, fighting off evictions and sometimes rioting; all of which frightened the complacent yuppie invasion. Fly landed in the Lower East Side in 1988 and immediately became an active participant in the burgeoning network of squats (Glass House, Fetus, Umbrella Haus, C Squat, to name a few) and alternative art spaces (ABC No Rio, Gargoyle Mechanique Lab, Bullet Space). Running for one weekend only, the exhibit and fundraiser will showcase Fly's personal collection of zines, comics, illustration, and, of special interest, parts of her DIY'ed personal wardrobe. Also for display will be an array of historical documents representative of New York City 90’s network of underground culture. Visitors can purchase donation packets which contain multiples of Fly’s idiosyncratic visual work from the early 90’s to the present day. I'm in the USA, doing a desultory tour of my book, "Occupation Culture" and the anthology "Making Room". I'm based in Milwaukee with my partner Malena taking a sabattical from her job. We tripped upstate with Dan Wang last month, to the artists' residency ACRE, west of Madison. That sprawling place is in the "Driftless" region of the state, where the glaciiers did not pass. The lovely rolling hills of this farm country make a pleasing rural setting for the residency. It's built by an architect who is very into salvage. Large beams of old growth wood from Chicago's tear-downs have been used to build the lodge buildings, and an airplane hangar was disassembled to make the cafeteria and workshops. My talk took place in a kind of screened in area with the artist residents seated on bleachers salvaged from a high school. It was performative, and concluded with Dara Greenwald's wonderful short film, "Tactical Tourist". We met Claire Pentecost and Brian Holmes as they emerged from tubing down the river next to our "rustic cabin" -- (that means cold shower, brr!). The next day our host, Dan Wang, took us on to Viroquia, where we visited the massive Driftless Books store in an old tobacco warehouse. Back in Madison, we saw the famous farmers' market around the state capitol building. Had to buy a shopping bag... Wisconsin has a very strong local food culture, and we were happy to visit large sprawling cooperative supermarkets in Viroquia and Madison both. This is the future, we must hope, and a far cry from the out-of-the-corporate-can feedlots one finds on the U.S. interstates. Just this week we turned east, to Michigan. Our first stop was Flint... after a long long drive, like Midwesterners often do. Flint is a famously afflicted city. Famous, because of Michael Moore's film "Roger and Me," which details the systematic betrayal and abandonment of the city by its major employer, General Motors. It has fallen into steep decline since, with massive house leaving, epidemic arson, torturous crime rate -- your regular rust belt nightmare. Stephen Zacks, a New York City based writer, is a native son. He's set up a public art program there as a giveback to his boyhood home. We lit out for Flint from Milwaukee late in the day. We still hoped to make it by nightfall... Fools, we'd believed the online travel times (Michelin and Google). 1) You don't take 94 through Chicago, you take 294, the ring toll road through Cicero (it's still a hairy hourlong ride with heavy trucks, but at least you're moving); 2) Michigan time is an hour ahead of Wisconsin. Our hopes of arriving for the Flint Art Parade were quickly dashed. Stephen Zacks, our host, had also scheduled my talk for that night, not the next day as I'd thought, and that was not going to happen. We made it to a chain motel outside Battle Creek, which appeared to be run by ex-junkies, in a room spittin' distance from I-94, which serenaded us all night. Dinner was at Denny's, the 24/7, with a gallery of weird Americans sauntering, hulking, wheeling in and out. We arrived in Flint the next day, and Stephen gave us the tour of his public art project. The office is in a downtown building that served once as an all-ages music venue, and today has numerous other leisure and service offerings. We met the project's young French architecture intern. Flint has a Land Bank run by the county, an office building downtown which hands out abandoned properties to those who show they might make something of them. Stephen has two -- one, a living space and planning center for those working on his public art project, and the other a painted decorated supply shed. Other houses nearby are abandoned, painted on, and squatted. Two had been recently burned, and neighbors were pitching in to help clean up one of them. We were invited inside to see the fine 19th century decor of the house by two guys who seemed too old to be doing the heavy demo cleanup they were doing... but Michigan grows them hardy. An old comrade, the artist GH, had built a white spiral construction supporting a chute-like form for this year's project. The city building department had taken umbrage, insisting it come down. Stephen was circulating a petition to save it in the neighborhood. We met the mayor, then a couple of local machers standing in an open-air gallery of bronze figures depicting town heroes of the modernist era (e.g., Mr. Chrysler, and others more familiar as brand names). We saw the GM heir who runs a foundation hustling down the street, talking on his cel phone, on his way to his office in the town's only high rise. Stephen described the lay of the funding landscape. He is doing what he can in a country that basically doesn't believe in art, nor understand art and artists. Nothing much can be done about that, I think; but I am wondering what I can do in Flint when I next return to that challenging city. This text appeared during the moment of Spain's recent municipal elections. Coming from a long-time activist who was then elected to office, it is a reflection on what the squatted social centers active throughout the country might offer to the new formations of governance. This blogger came across the article referenced on the website of the recent mission of U.S. activists called "nyctospain.com." posted at diagonalperiodico.net as the website of the fortnightly Diagonal newspaper, May 21, 2015, as "Centros sociales y revolución democrática"
We cannot, and should not be what we are not. As Subcomandante Marcos says, "Practices should think about themselves, instead of theory thinking about the practice." So we go ahead thinking about ourselves. In our cities there are some spaces where the same people work, with autonomy, and hence beyond both institutional logic and that of the market. These are places of meeting, of daily life and of collective projects: an urban community garden, a cooperative bookstore, a pub for the youth in a neighborhood, a P2P laboratory, a community center full of life, etc. The Ateneu Candela is one of these. This social center was born 14 years ago in the city of Terrassa (provinnce of Barcelona), in an old textile factory renovated collectively. Unlike the political parties or classic organizations it does not require affiliation; membership in the social center is built on participation -- a lot of people participating in many initiatives like a cafe, a bookstore, a consumer cooperative, meeting rooms, a stage for performances. The engine of a space like the Ateneu Candela is its people in motion, and it is these people that support it. People inhabiting the community center have many ways to participate. It is their nearest community. 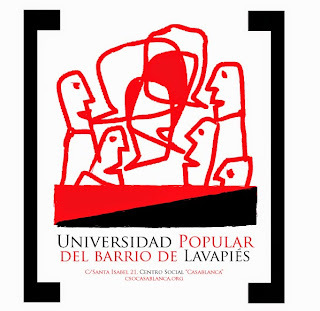 Social centers are also interconnected in a larger network: La Casa Invisible in Málaga, La Pantera Rossa in Zaragoza, Katakrak in Pamplona, El Patio Maravillas and la Villana in Madrid, and many others. All these social centers are open spaces in the city. We are not talking about places for a group of similar people, but for many people who in their diversity recognize each other as equals in the face of the becoming-precarious of their lives, and who cooperate with each other. They are places for living well, where people stand up for their rights with joy, and contribute to the transformation of the city and their lives. Social centers in general have been, and still are meeting spaces for dozens of projects and initiatives -- political, cultural and social -- which have generated many networks of people and groups, promoting forms of cooperation among equals. For many years we have demanded our "right to live in a city that is not subordinated to the interests of a few"; we have put other ways of living our lives into practice and under experiment. After the 15M [movement of 2011], participation in the social centers grew, and the list of people and groups who use the Ateneu Candela as a meeting place has not stopped growing. The place is currently gaining strength everywhere, with the chance to take on the 'mafia', and attack the institutions that have been captured by the 1% over the years, at different levels and with various brands. This is happening also at the local level, with a new wave of citizens candidates standing in elections for local government. In many of these new electoral platforms people linked to social centers are involved. And conversely, many of the citizens engaged in these campaigns have begun to participate in social centers. ¿Surprise? No. Although some now have rushed to sound alarms about this -- we are living a democratic revolution. Not only here in Spain, but throughout Southern Europe, the Mediterranean, and this revolution has even reached Hong Kong. The 15M movement began here in Spain. In the social centers and elsewhere, people around the Ateneu Candela made up the crowds and the power in the public squares. And as noted above, many people in the streets began to participate later in the social centers or other public spaces, including the Ateneu. The same democratic revolution that began with the 15M, is now embodied in the new citizen candidacies: the 99% is doing politics and struggling for their lives in multiple connected ways. We can ask a few questions about all this: How do the people of the social centers position themselves in the midst of this effervescence of real democracy? What can we expect from this cycle which is shaking the elections and opening institutional spaces? Are we not going to need these spaces of autonomy once citizens with the DNA of the 15M movement fill elected offices and institutions? What can we contribute? We stand together with the 15M: close, but in a different way. We are close because we are part of the democratic revolution, and we want real democracy now. And in different ways -- as many ways as the diverse people who participate in the different spaces. Social centers like the Ateneu Candela, unlike traditional parties or some classic political organizations, do not require membership, and affiliation is built from that same concrete participation. It is not a fixed organization, but rather is involved in multiple projects or initiatives. This allows, in turn, multiple forms of participation. 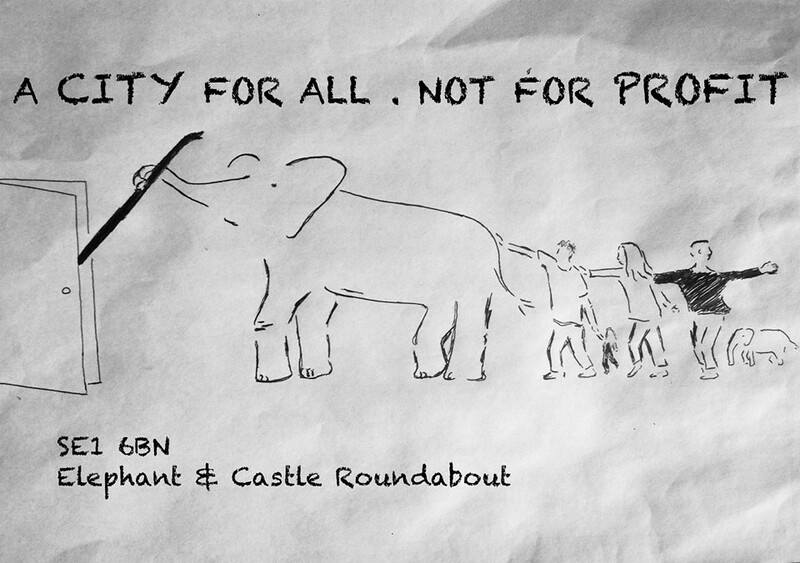 With the democratic revolution we hope to retake the city from the hands of the 1% and return it to the people. We want to win the right to the city, and secure a real democracy. Because we are not merchandise. We know that is not enough, but it is what we have long been committed to achieve. However, we are not naive. As Déborah Ávila and Marta Malo say, "the institutional assault is not the only way," because in addition to the 'ceilings' of the mobilization, new 'ceilings' appear when it comes to institutions. "There is no doubt that the institutions could improve the lives of the majority, but we also know that not all social models, lifestyles and behaviors today, emanate from institutions." Real democracy would take center stage and would accelerate when people massively break into the institutions which have been hijacked by the interests of a few, and return them to the service of the 99%. But when this happens "it will require a mobilized society that continues to create other tangible sustainable ways of living". 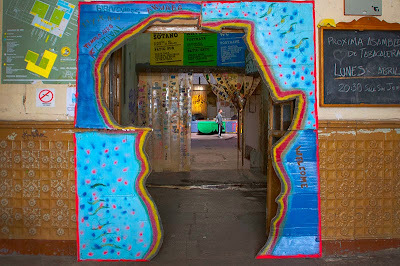 Social centers have been, over the last decade, places of experimentation in new city models based on social rights, in different forms of democracy at the local level, and new ways of understanding culture and access to it, or in laboratories of free software and digital fabrication. These laboratories for innovation in production based on common goods [los bienes comunes], have resulted in experimental apparati of creation and production, de-precarization and empowerment. Since the Casa Invisible of Málaga, we think that the main contribution that social centers can make at this moment is to put on the table their years of experience in "challenging the traditional institution from the perspective of the commons". One of the great challenges facing different municipal leaders is that of building new institutions: the experience of the social centers is shaping up as something quite valuable in that task. We think like our friends in Malaga. As Felipe G. Gil notes, the "inhospitable" public institutions have much to learn from the "open and inclusive operations that occur in communities not invaded by the very bureaucracy of public institutions". 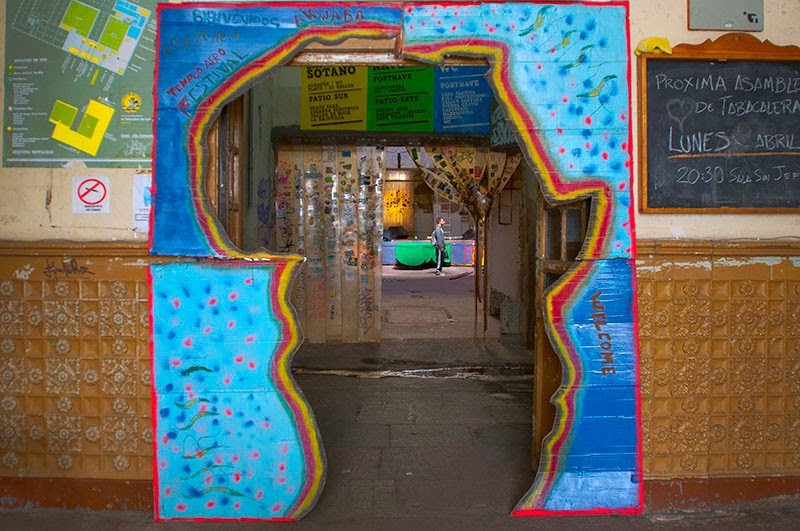 Social centers, and their practices related to the management of the commons, have generated tools that can revolutionize the institutions and public spaces, such as "protocols and methodologies that promote inclusion, hospitality, openness and connection." Social centers are spaces which permanently interrogate themselves. They walk while wondering, and don't have problems when it comes to changing the space itself, nor their ways of making and organizing, nor building alliances. One of the big deficits of political institutions in deep crisis lies in their rigidity, their inability to regenerate, to innovate, to correct what does not work and reinforce what does. Social centers bring fresh air to this issue, creating living, dynamic social processes that permanently transform, adapting to changing times, but also providing storage, buildup [acumulación], shelter -- in difficult times -- and openness and change as the times require it, always fleeing from dogmatism with an unquestioning loyalty to autonomy. It will be critical that the social centers organized by citizens continue to exist with their own independent character. As Felipe G. Gil says, "it is time that public institutions learn how to care for and manage the common goods of the social centers". Civic institutions and public facilities should use the management tools of the peoples' spaces and come to resemble them. These places should rethink themselves, and learn from citizen movements, some of which live in social centers. Governments should listen and obey their people while working for a better city. Now, those who want to storm the institutions to get rid of some and put others in their place should think again. This is about bringing democracy to the people. Real democracy and institutions that are of the majority is a challenge that has only just opened up, and therefore it is vital that "social centers organized by citizens continue to exist with their own independent character." The city that we imagine is full of spaces that move people, with autonomy, common areas of life for people and collective projects that transform the city to make it better. One or more in each district, with its wealth and particularities. Places that can be developed as they deserve without having to continually suffer the scarcity of resources to survive or simply have a roof to develop. Projects with their own resources and publics -- which are the people -- to deploy all their transforming power. *Link posted at "nyctospain.com" report on the visit of NYC activists to Spain during the May 2015 elections with the following comment: "Great article exploring the role of social centers in the "municipalist" revolution from our friend Xavi Martinez who we met a few days ago (and some of us have known for years). He's a leader from the PAH, active in the Ateneu Candela, and as of yesterday, a council member in Terrassa!" I'm going to rant now, folks, so feel free to change the channel. I just watched a little interview with a guy who was billed as the "creator of Occupy Wall Street," (didn't notice that one, eh? Yes, your movement was "created") -- and read an article on "lessons from the Spanish movement" by a pimp for Elizabeth Warren. Both these folks seem to think that the lessons of Podemos and Syriza are that the left should move decisively into the electoral arena in the USA. Forget all this organizing stuff and putting people on the street and all. Apparently these people had their eyes firmly closed during the many years of runup to these electoral victories. That would be the endless demonstrations, encampments, and pitched battles in Athens. And it would include the large networks of mutual aid that emerged all throughout the islands of that nation (which were imitated and perverted by the right wing there), which lay outside the purview of Syriza. So this beanbag for Warren suggests that Spain's movement was animated by a network of social centers which provided the space for people to organize. (They were getting arrested when they met in public space.) We could do that in USA, but y'kno the rent's so high and all... What this author neglects to mention -- part of a contingent who visited Spain, who went to the social centers in Barcelona during election time, and certainly knows better -- is that these spaces for organizing were squatted! Yes, I mean taken over by citizens who refused to pay rent to provide themselves with the political and cultural urban space they needed, and entered a legal process of contest for use of the property they occupied for purposes of commonsing. This author also fails to mention the weekly mass demonstrations against cuts in social programs, and the back-turning on ministers by cultural luminaries because of cuts to culture, and (excuse me) the General Strike! The pitched battles with police by black-clad anarchists who could be seen on TV live from Burgos scampering merrily along in the background as angry elderly voiced their opinion of city hall to the cameras. 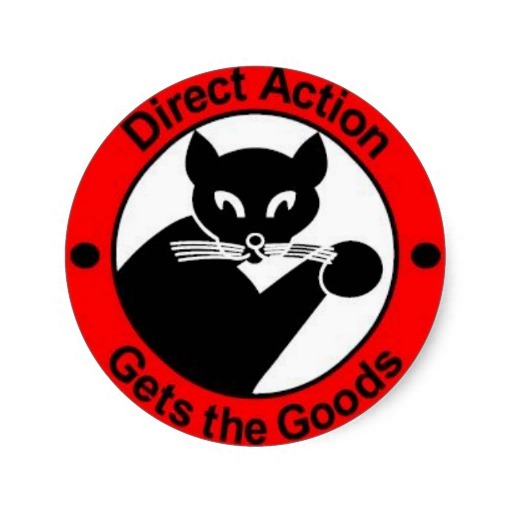 Direct Action Gets the Goods. It's an old anarchist slogan... and when you forget it, you can just turn to Tammany Hall, vote their way and look forward to your Christmas basket and maybe your cousin gets a job... while old man Plunkitt takes his opportunities upstairs. The Warren person's post was linked out of the website of a group of activists who visited Spain recently, during the exciting municipal elections. (It's at http://www.nyctospain.com/.) These guys presented at the Left Forum recently, where left activist strategies are debated, and decisions made which determine a lot of what is going to happen on the ground in U.S. cities, since the funding agencies which back these professional activists take their cues from these conversations. I was communicating early on with an organizer of this visit. I suggested that they visit our conference at some point -- Squatting Europe Kollective -- which was happening at the same time. I certainly can't blame them for giving that a pass... But they did visit social centers. They did visit Can Batlló, a complex of factories that has been taken over by citizens' assemblies. The renovations are being assisted by the Barcelona city hall. Why? Because the citizens' assemblies told them they were going to squat the place if they didn't come to an agreement on its use. I should not be surprised by this failure to include squatting in their report to North Americans. Even as I peruse the Chokwe Lumumba plan, the plan for grassroots economic redevelopment of Jackson, Mississippi devised by the Black Panthers' lawyer and derailed by his sudden death, which would have used city funds to develop the kinds of structures of citizen participation as Spain, I read Neil Gray's review of David Harvey's Rebel Cities book, in which the socialist is taken to task for ignoring the Italian Autonomist movement ("autonomistas," he remarked snarkily at a party I attended). Harvey gets it, as Gray quotes Blanqui, that "rent devours all." But his "aporia" on the Italian movement which generated the social center model for squatters across Europe (and his idealization of the Communist Party of Italy which repressed the Autonomists) extends to all the minoritarian movements, both political and cultural (punks), which made counter power and autonomous zones for the last 40 years. The fish of theory also rots from the head. Let's see how this might be begun. Student movements have resisted street austerity cuts around the globe through pitched street battles -- and won. Only not in the USA. Schools are being closed all around that country. Fine. Take 'em. That's property paid for by your tax dollars, built for public interest. Commons it. As long as these direct action strategies are not part of the calculus of U.S. activists, and especially the (often professional) people who presume to lead them, so long will the hopes and dreams of many continue to be unfulfilled, and energy and money circle endlessly around the electoral drain. Erica Sagrans, "6 Lessons for the U.S. from Spain’s Democratic Revolution"
Neil Gray, "Whose Rebel City?" Which is very difficult. 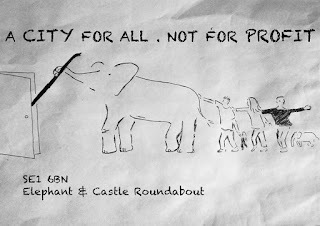 It is easier to be critical, resistant, to things as they are than it is to assume responsibility for the welfare of people, to manage infrastructure when there is no one to complain to. The Barcelona meeting of SqEK, however, this time included reports from self-managed factories and workplaces. And, at the same time the meeting was being held, Barcelona was going through an electoral campaign and election. The winner -- Ada Colau is elected mayor of Barcelona, the squatter leader of the PAH anti-eviction group. So... change is in the wind, big change. Many left politicians in sympathy with the movement of the commons are coming into power. 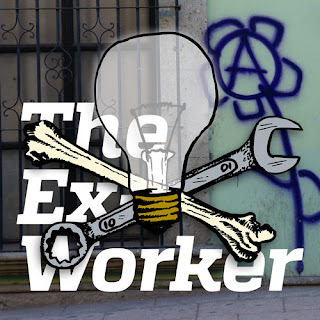 How is the squatter movement going to work with this new emergent restructuration of political power in Spain? A speaker at the Puerta del Sol, Madrid, on 15 May 2015, 4th anniversary of the 15M movement. This was one of the very big questions hanging over our meeting... and it was evident in the absence of many otherwise interested Barcelonesans -- los barcelonense -- from our meeting. They were all out working for the Guanyem slate and Ada Colau. I wish I could weigh in further on this question, and get into the content of sessions at the conference. But the action in the SqEK 2015 meeting for me revolved around an exhibition. We made a show of posters and zines from the squatter movement. I worked on this for weeks ahead of time. It was mounted in the vestibule of a theater for the opening reception at Ateneu Popular 9 Barris. This place, built mainly around a theater and circus training school, was once a squatted factory. Now it is fully legalized, and rebuilt as a comfotable facility in cooperation with the city government. Even though many now receive a salary to manage their place, the people of Ateneu 9 Barris, feel in sympathy with the social movement of squatting. They display a proud timeline detailing their activist period, when a stinky and poisonous factory was suddenly installed in a working class neighborhood. The neighbors were unhappy, and organized against it. Nothing happened with that, so, finally, they decided to occupy the factory and shut it down. For some years Ateneu Nou Barris ran as an occupied space. Alan Smart, the co-editor and co-designer of the epochal "Making Room" anthology, put up a dense assemblage of texts and images from that book, mixed with photos Frank and Vanessa brought from the NYC LES squatter movement. Galvao arrived with tons of the zine and book material he had been printing for us throughout the week, and we filled several tables with a cornucopia of resistant literature. With the arrival of the other SqEKers, we were ready for the first day reception of our meeting. The show we put up was only there for a few hours. We had to clear it out because the Ateneu was having a big Balkan music festival the next day. Sigh... So everything was packed into the big rented van, and was trucked to the next place. That was the IGOP institute of governance studies of the Universidad Autonoma of Barcelona. There in the second sub-basement -- yes, we're talking way underground culture! -- we re-installed the posters and zines, which Galvao had printed tirelessly over the a week's time. This time we mixed in the expository posters which many of the academics presenting had brought with them. During breaks in the sessions, conferees gazed at all the visual material, discussed and browsed the zines. At the conclusion of the sessions, we moved up the hill, to the famous squat of Can Masdeu. That is a former hospital for lepers squatted many years ago as a permaculture-based commune. By now energy was lagging. We did not reinstall the exhibition, but the Beehive put up their banners and talked about them to the Spanish who came to the special SqEK public event. Afterwards Carlo of the Sublevarte collective from DF and Tobi presented on their work -- about the Mexican autonomous movement and the subversive street art of Berlin respectively. Now we are sifting through the material gathered, and I am readying my trip to the UK for the first sessions discussing my new book, Occupation Culture: Art, Squatting and the City from Below, from Minor Compositions. I'll be speaking (and listening!) at the Cowley Club in Brighton June 24th, and as part of another "gathering" event for UK squat materials at the wonderful Mayday Rooms archival project in London on the 26th. 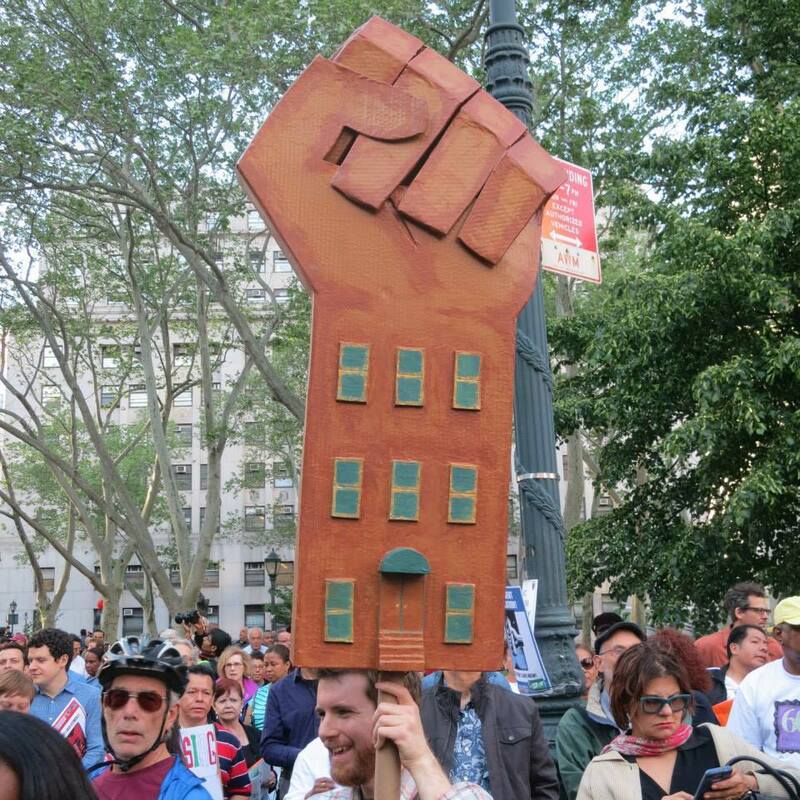 Bas-relief signboard for the recent NYC tenants' rights march, by Seth Tobocman. An exhibition of the movement continues through June 15 at Interference Archive, Brooklyn. This big annual event, the meeting of our research network, is rushing right up. Funded by the Antipode Foundation, a relative of the geography magazine, the conference concerns: "Squatting Houses, Social Centres and Workplaces: A Workshop on Self-Managed Alternatives." (website: sqekbcn.squat.net/sqek-meeting) At the reception May 20th, we'll be premiering the new anthology, Making Room: Cultural Production in Occupied Spaces [PDF link TK]. The conference is still open to participants, pretty much up to the last minute -- although funds for travel are gone, and accomodations may be scarce. But, after all, it's squatters, so a way can always be found, if you feel hardy! Our groupuscule is making an exhibition, for which we continue to solicit posters and display panels explaining autonomous projects. Please give the "call for materials" pasted below a look -- e-files need to come now, but the show will go on to New York, USA, in September, so there's still lots of time to send stuff in to what we hope will be a big suitcase lots of people will get to see. The call for materials is pasted on the bottom of this blog post. The table of contents of Making Room also. I continue here with what I call the "pimp text," the draft promotional text for the book which is being distributed by the venerable Journal of Aesthetics & Protest (joaap.org). Making Room: Cultural Production in Occupied Spaces is a first of its kind -- an anthology of voices from the post-1968 squatting movement in Europe which is focused on creative production and cultural innovation. Is squatting art? It is certainly a tactic which has enabled a tremendous body of collective work in culture to be done, and new kinds of lives to be lived. Making Room lays it out in the words of those who did it and study it. The dark matter undercommons of disobedient culture surveyed in this book begins its roam in a theoretical introduction including autonomist theory, the ways of "monster institutions" and simple economic justice. Then it moves from north to south, portraying by country the specific local conditions of an international movement. In the Netherlannds, we visit the strongholds of the hippies, the festive "temporary autonomous zones," and the rough-and-tumble conflicts of the Amsterdam squatters who once had that city in their hands. Later squatters were artists, forging international connections, and facing up to government recuperation and a new capitalist stratagem to hold them down. A cultural manifesto and timeline of the venerable Christiania kicks off the section on Denmark. Then texts roll on to the war of the punks to save their youth house, and the "candy factories" of today's artists. The last 30 years of squatting in London is surveyed, the flaming boil on the resistant body of the United Kingdom, as well as a close look at the deeply weird communes and squats of underground art cults. The famously crusty German movement is examined in detail, from its beginnings and imbrications in violent resistance in Berlin, to its house projects and collective workplaces -- its "rainbow factories," "red islands," and Queeruptions. Mural artists who directly support this political movement are surveyed, as well as a series of close brushes with high institutional art culture, and the most recent hipster-squatter alliance in Hamburg. Italy is the wellspring of the social center idea, which is expertly surveyed in terms of its results -- its places, not only its theories. The legendary street media movement is explained, and the new resistant occupations of precarious cultural workers in Rome and Milan are discussed by participants. Paris, as we might expect, has developed a cultural policy to integrate the "art squatters" into a new form of bohemia, a house brand of French culture. This institutional recognition is explained, as well as its resistance, the legacy of Situationist positions. One text covers the very strange underground occupations, and another closely portrays a renowned music venue in the days before its certain eviction. The Spanish movement has been one of the most active in Europe, and here it is examined in its ideological dimension, and in terms of its mediatic images, both negative and self-affirming. The rich cultural production of the movement is examined in a text on "ciclocostura," bicycle based self-fashioning, solidarity research groups with domestic workers, and anti-gentrification campaigns. The struggle of the Casa Invisible to legalize is told by them, as is the story of the wall poem revealed by demolition in Barcelona. Making Room departs from the national frame in a section called "Everywhere: Transnational Movements, Networks and Continuities." Here authors discuss Puerto Rican occupations in New York City, the uses migrants in Europe make of squatting as well as activists' solidarity in a "universal embassy" occupied in Brussels. The culture of the large Ljubljana squat Metelkova is discussed at length by the programmer of one of its major punk venues. The book concludes with a group of texts, "Anywhere: Media, Virtuality, and Diffusion." Texts treat of stereotypes of squatters in mainstream media, and the media squatters make themselves -- a steady stream of zines and films, many online. Another author considers the ideology of punk music and the economic networks it has generated. And finally, the book includes a major piece on the development of hacklabs in squatted spaces in Europe, precursors and anti-capitalist runalongs to the rise of the commodified internet. Presentation of the Beehive Collective's pedagogical banner "Mesoamerica Resiste" (photo by Frederick Blichert). One of the "Bees" will be a guest artist in Barcelona. Nearly all the texts in Making Room could be the germs of books in themselves, so resolutely has the subject been ignored over years by mainstream media, publishers and academia alike. This book is opening a long-locked door on the tremendous untold achievements of the disobedient movements. It's the beginning of a look at worlds created outside of rent, waged labor, and bureaucratic control; a response, in Brian Holmes' words, "the great unanswered question of a society with no imagination." 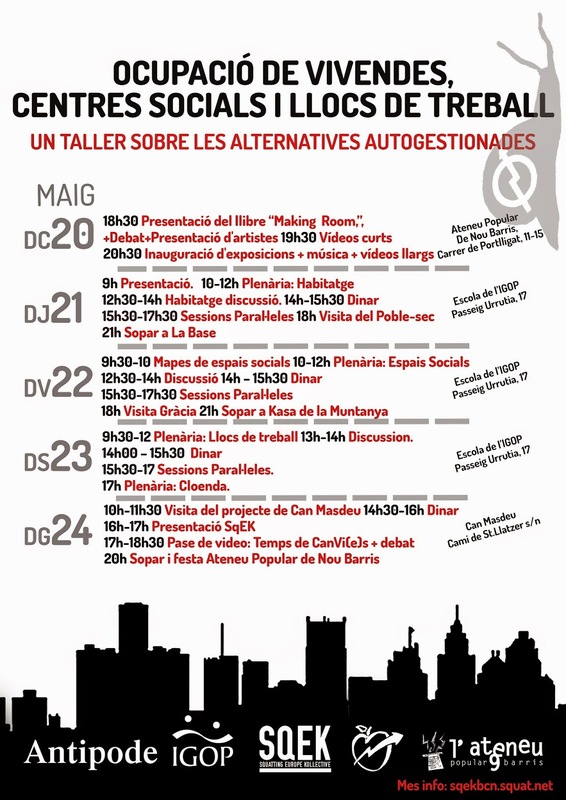 One of the Sublevarte activist art collective, from Mexico DF, will be a guest artist in Barcelona. Produced by the "House Magic" information project on squatted places in collaboration with the Squatting Europe Kollective (SqEK) at L'Ateneu Popular 9barris socio-cultural center in Barcelona; and in New York City in September at ABC No Rio cultural center, and in collaboration with Interference Archives, Brooklyn.